Costa Rican Aeronautical Cafe machine is right on the money. Nowadays, thanks to the rich volcanic soil, Costa Ricas well-known for its gourmet coffee beans with the famous Tarrazú considered among the finest beans in the world. Along with bananas, coffee might just be the most famous Costa Rican export. As well as exporting many farm grown fruits, there are small pockets of this part of the world that from a Motorcycle building perspective, that are absolutely mind blowing. 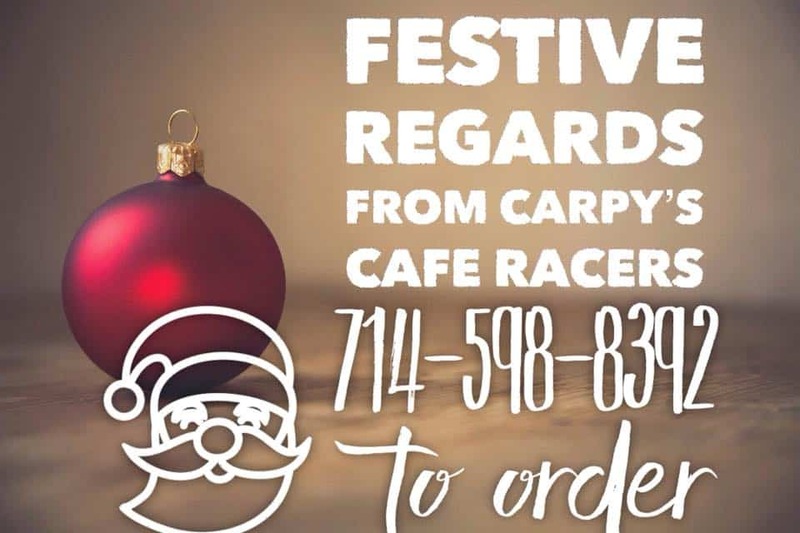 So, if you have a map and you want to know a very cool place to visit in Guanacaste, well there is an international airport located in this Tropical Paradise and not far from Gian Maria Traversone, where this man of many talents and interests is planted. When Phileas Fog decided to circumnavigate the world in 80 days, he missed out one of the many wonders of the Motorcycle world when he took that trip,albeit over a hundred and 30 years to early, this would of been a fantastic stop in the Golden beach Blessed area of Guancaste. Gian has many strings to his bow and I am sure he could play many Harmonic tunes to the sound of success in his long learned experience as a Builder, Designer, Rally driver and of course a pilot too. 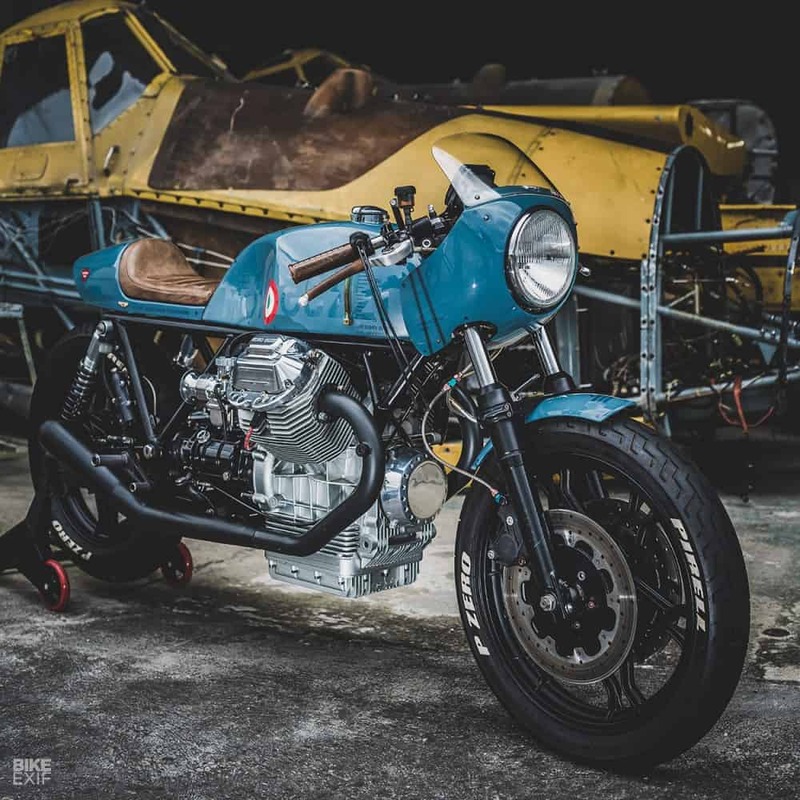 So, we begin with the ride, and as Gian is a Mad aircraft aficionado- he wanted to create an aviation-inspired 1982 Moto Guzzi Le Mans Cafe bike and use all his experience in creating a eye catching machine that even I would love to have back in my Garage here in La Mirada California. There has been ton’s of Aircraft inspired Motorcycles, some are pretty awful, but many have great design and style, but this machine is on another level, and I mean at 30.000 feet. This bike has Attitude and Altitude and I love all the work that has gone into creating such a eye pleasing mode of transport and, if you cannot see that this guy is a Pilot, or at the very least, loves planes, then I am afraid its a lost cause for you. The rear seat Cowl was hand made using high quality Resin and Fiberglass matting and this has some lovely lines to accent the Gas tank too. 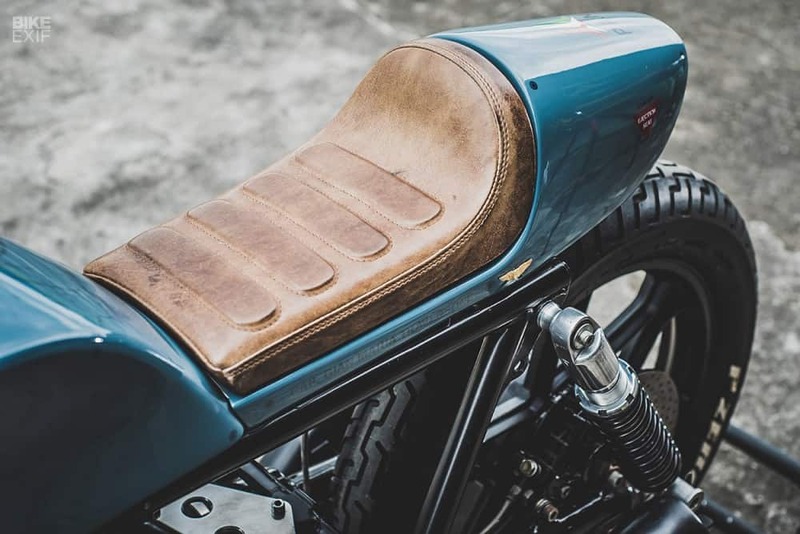 Take a look at the seat upholstery, not the standard Flat seat you see so many of, time and creativity paid off big time as that Worn look is not Faux, it is the real thing, using an old Leather jacket for the Medium, Bravo Sir! Bravo! The subtle lines are just really flowing and take a look at the Gas tank, this was hand formed to made the Knee recesses just right and follows the lines of the bike and tapers in a streamlined fashion, to the same contours as a planes fuselage, thats no easy task and I for one know how hard it is to get this right, many hours of nail bleeding arm aching bashing with a hyde hammer to get anywhere near, then to Plenish it with an air tool l to get anywhere near this complex form, is just great to see. The bike is a good looking Platform anyway to create as a Caff Bike, I have only owned a couple but back home in the UK the parts were Bloody expensive so I chose to go with the Honda’s for affordability but- all that said the Guzzie is such a smooth riding machine, its a brilliant bike to ride and takes no real strength to ride, so understand Gians interest in this Italian Stallion. Some New 14.5 inch aluminum and Black rear coil overs with a stiffer preset were chosen and then the Original Rims looked cool anyway, Gian decided to just change the Tires, this was done using some stock Michelin tires and then lettering they’re sporting Pirelli P Zero logos, as that goes back to the Racing days. To give this machine a little more aggressiveness, Gian changed the Rake of the frame at the front by cutting at the neck, changing the degree and then gussetting and strength welding back again, this gives a way better look and will fall into the Corners a little easier as well. 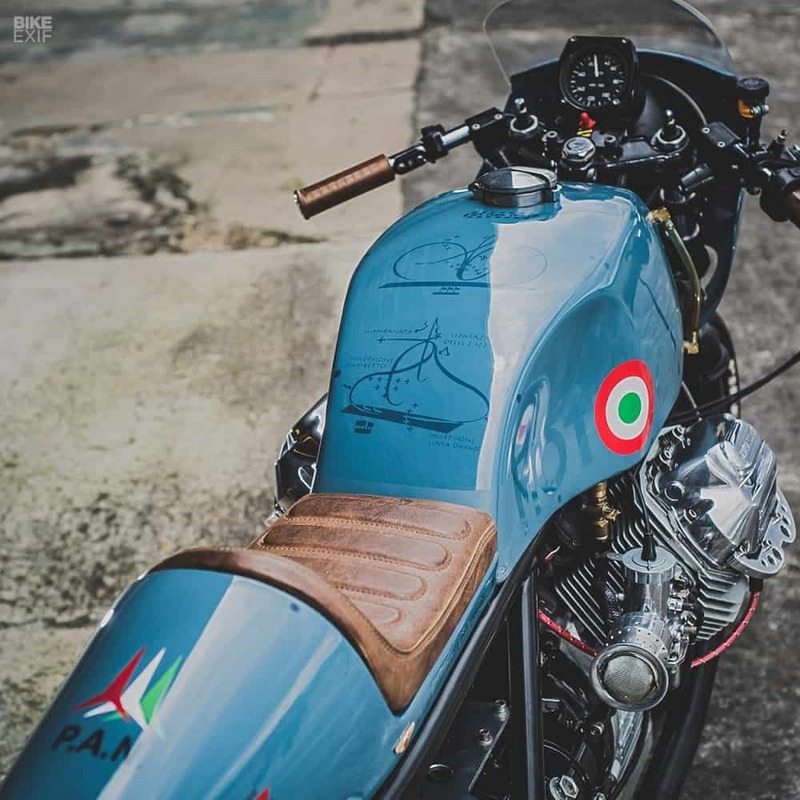 That’s a time consuming job and done correctly as geometry is key to any motorcycle and remember, Moto Guzzi spent many many hours in the RNR room getting the right angles for this machine for a Road ridden machine, so Kudos to Gian for having a go and getting it right on the money. The brakes were all replaced, Calipers rebuilt and the use of Aircraft brake lines make sure this Aeronautical Twin Disc Caff machine stops in a short time when needed. Now onto the Power plant, The V2 Four stroke motor was removed and this was then boxed up and taken to Team Guzzi Motobox—specialists in Spain who prepare Le Mans engines for endurance racing. They treated it to a head job, and rejetted the carbs. Back home, Gian Fabricated a set of Old School free breathing new mufflers,Then Coated them with high temp paint in Traditional Black, then added a pair of velocity stacks with built-in filters to the Carbs etc. He also modified the intakes to get the carbs to sit at a better angle aesthetically. Once back together, Gian and the team re configured the wire harness, as the stock version has so much spaghetti, that it needed to be changed for a more easy to understand set up and also to keep everything basic and what is only needed, no fancy buzzers and whiz bangs here, then the New Lithium Lightweight Battery was added but this time it was moved from the stock location to be hidden behind the bulky transmission. Having a closer inspection, I only notice on the electrical side that there is a front headlight but I do not see a tail light or turn signal location, so maybe a back to basics set up but If I do see anything else I shall add it n the blog, but take a look at the cockpit area, its very minimal with a couple of Custom micro switches to get this Motorcycle functioning as he wants it to. The speedometer is a classic all the way, an actual Air Speed dial in Knots that was from an aircraft and to make this work it correctly the team fabbed up an old air speed style conical Nozzle to allow the correct CFM to enable the speedometer to read the correct amount of flow to give the correct amount of speed, no easy calibration task but the gang pulled that one off and it is as Aeronautical as you can get. 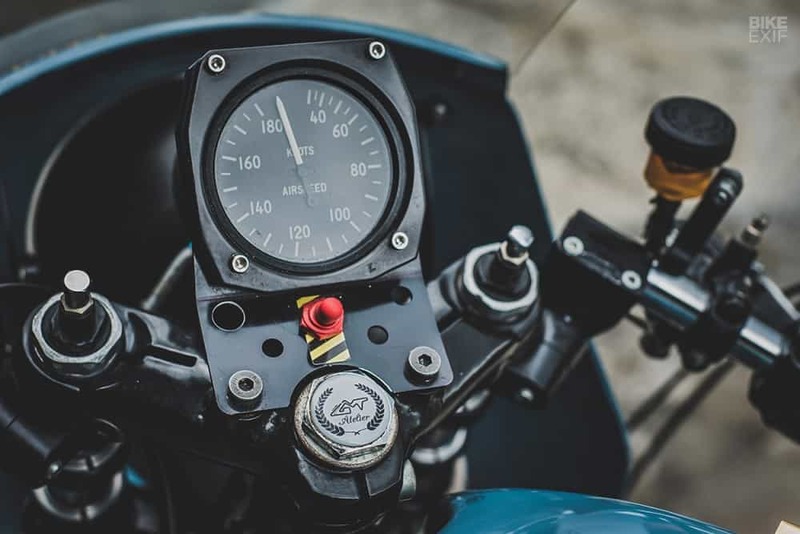 As you can see the uncluttered top end is great, using modern master Cylinder, some cool Clips on and new grips to follow the seat style and of course on the gas tank a New Monza cap was fitted to make sure it shows a little more Italian Racing. 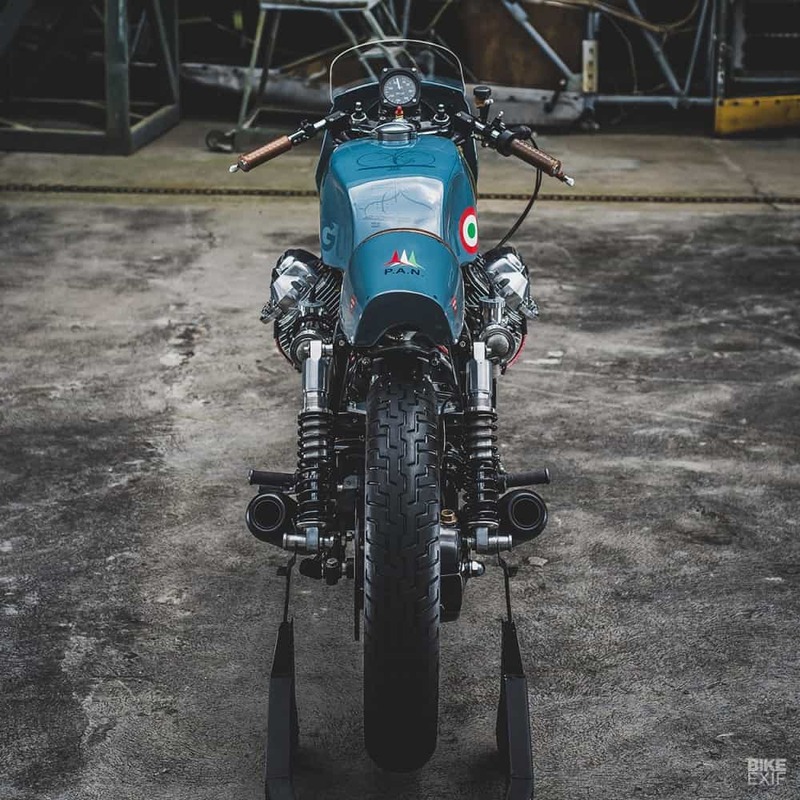 Now, bring me onto the gas tank-Gian looked to the Italian Navy’s acrobatics squad—Pattuglia Acrobatica Nazionale—for the Moto Guzzi’s final finishes. The Navy insignia in the place of the ‘O’ in the logos on the sides of the tank is an obvious hit, but the paint job’s also littered with warning messages and markings you’d find on planes. Take a closer look at the tank, and you’ll notice that it’s adorned with some pretty unusual graphics—the maneuver diagrams that PAN pilots keep in their cockpits while performing. A tattoo artist friend of Gian’s applied these using a transfer process. Boy did they pull off a superb set up, this just screams Aircraft and so nice to see a different graphic style to the many out there, making this a unique paint design that you will not see in many places I am certain. I am not sure on what the time scale was on the creation of this 1982 Italian Road hugging caff machine but I tell you, it was worth it all, and with a New Set of rear sets added, the riding stance is now bang on to math the raked front end, I would dearly love to ride this around and I am Jealous in a good way to have seen this motorcycle build. The bike was taken to an old crop Dusting hanger to give that whole Aircraft feeling and boy does it catch the moment. 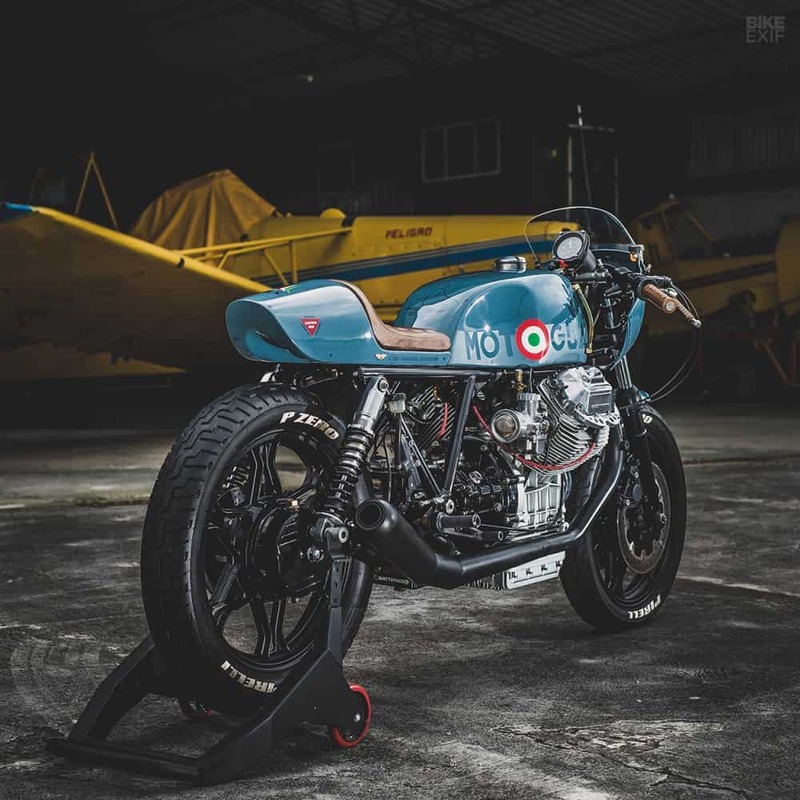 Thanks to Bike EXIF for the photos and maybe one day when we head out to Porto Rico, we can drop in on the Crew at GMT Atelier and see this Motorcycle and all the other great Nostalgic bikes and vehicles as well as old planes etc. Great Job mate I loved it all. 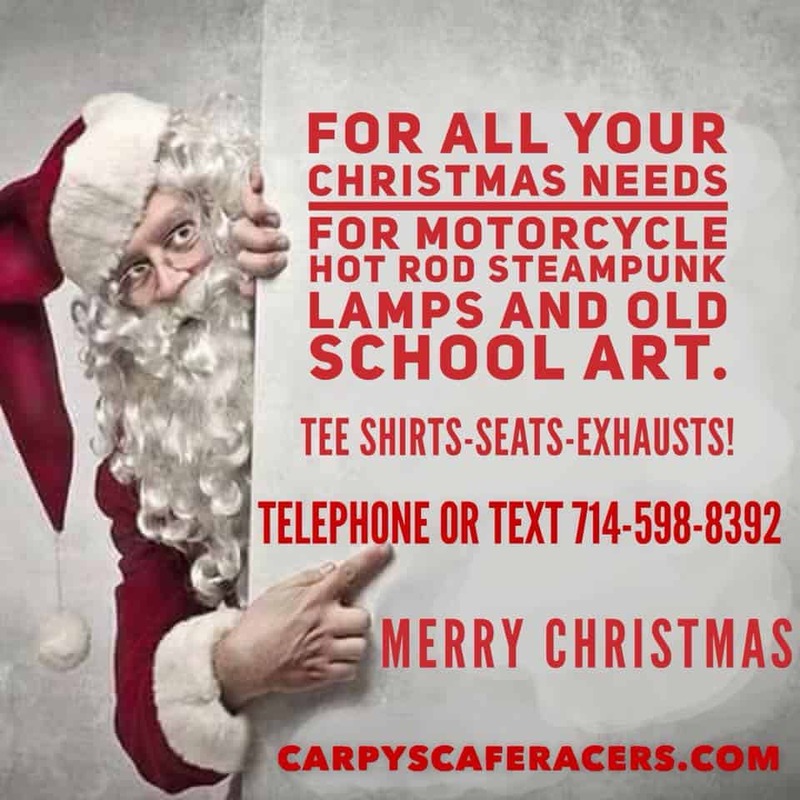 Merry Christmas to all my Customers and friends around the world, I hope you have a fun time at Christmas and maybe even get out on your Motorcycle to get the tinsel and Christmas wrapping out of your hair. 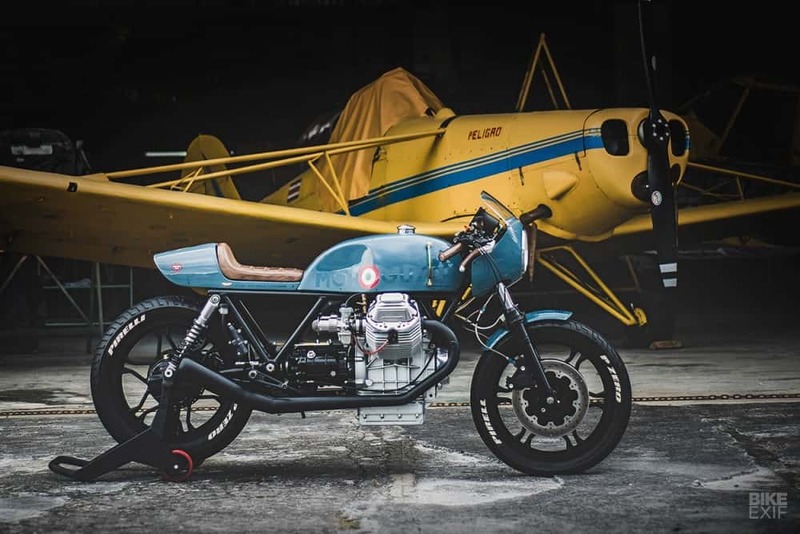 This entry was posted in Blog and tagged 1982 Guzzi, Aircraft style, cafe racer, carpys, Christmas Blog, Costa Rica, GMT Atelier, Guanacaste, italian motorcycle, le mans, moto guzzi, Shed built, ton up. Triumph Bonneville gets the Stealthy Look.